EPDM Flat Rubber Membrane Roofing System Canada, Ontario - Pro Roofing Inc.
EPDM membrane can be either fully adhered with bonding adhesive or loose laid and covered with ballast, offering clean installations without the need for traditional heavy roofing equipment. With membrane sheets up to 10,000 square feet EPDM roof can be installed much faster than conventional build up or modified bitumen system. As with most roofs, EPDM rubber roofs have varying lifespans that depend on numerous criteria. These include environmental conditions such as the type of building, how much foot traffic the roof gets, how much water remains on the roof after a rain, and how long it take that water to evaporate. The lifespan ranges from 12 to 25 years. 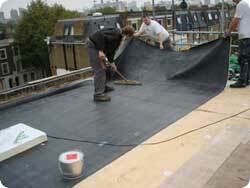 One of the unique attributes of EPDM is its ability to be easily repaired and restored. Even after years of in-field service and exposure to the elements, repairs or modifications involving the installation of a new roof curb into an aged roof can be accomplished easily, with the expectation of longterm performance. We have maintenance contracts with Pro Roofing for several facilities where we cannot afford leaks due to the sensitive equipment. The checks ups are performed regularly, with detailed reports. The company notifies us of any necessary repairs, with estimated cost. We recently extended the contract and added another property to the list, since we are satisfied with their work, approach, and personal customer service. Recommend the company for any commercial maintenance work.